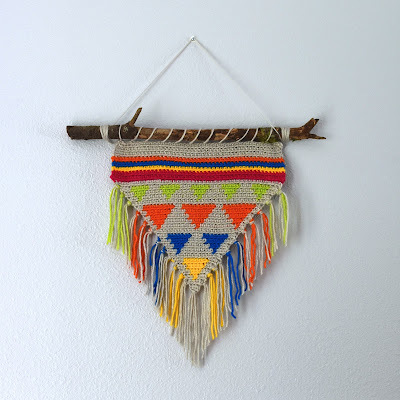 A couple of days ago I felt the urge to create this wall hanging. I grabbed the yarn, my pencils & paper to make a sketch of my design and then I went for it and started crocheting. My yarn of choice was Big Twist, I just love the bright & bold colors. I was in a frenzy, it was like reading a good book that you don't want to put down. The next day, I went on the woods behind my house and found the perfect stick and now my wall hanging is part of my home and I love it!